Low-level laser therapy is the use of low intensity photonic energy as a treatment modality. It works by using photonic (light) stimuli to excite the body’s cells, infusing them with energy to reduce inflammation, regenerate cells and increase blood flow. 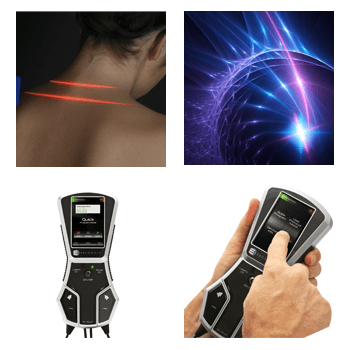 Low level laser therapy is a non-invasive, fast and effective modality that has been proven in clinical trials to reduce pain, reduce edema, and promote healing. Low level laser therapy is very safe; the only general precaution is the use of special filtering glasses when a class 3B laser is in use. The effect is greatly accelerated healing, rebalancing and rejuvenation at a cellular level. Inflammatory conditions, bursitis, tendonitis, myosistis, synovitis, fascitis and other inflammatory conditions of the tissues. The low-level laser therapy is very safe and its capability to penetrate the tissues makes it a stimulant, which induces cell growth and tissue repair. There is enhanced activation of the mitochondria in the cells, which restores the normal functioning of the cells. The increased blood circulation to the area also quickens the healing process.